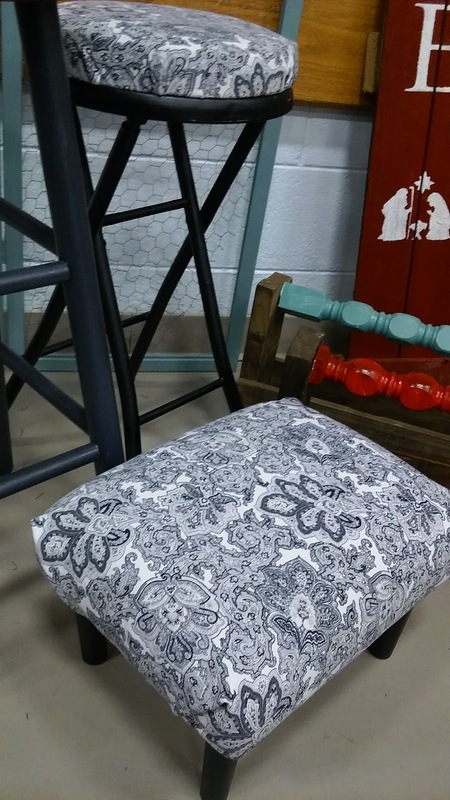 This ugly, dated, bland, shaggy foot stool was snatched from the curb on garbage day. Under all that shag, which was also lined with tassels (removed prior to photo), were sturdy blonde wood legs in excellent condition. The whole stool is sturdy, just seriously dated. It reminded me of a very shaggy dog. What do you think? Distant cousins maybe? 1. Used brute force and needle nose pliers to remove the shaggy "decoration." 2. The legs were sprayed black and sealed with a polyurethane spray. 3. I simply recovered the top cushion with this black and white duck cloth remnant piece, securing with a staple gun. Other than dry time for the paint and sealant, this was a quick transformation. It looks so so so much better than before! 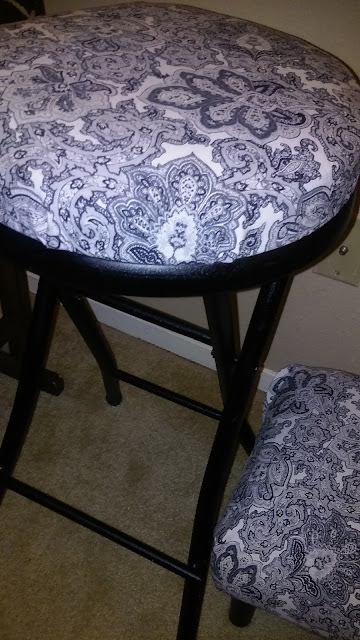 I have no before pictures for this stool...and I honestly don't remember where it came from. 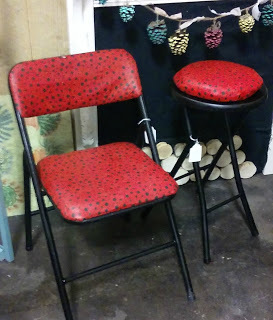 Originally I had it covered with a ladybug print to sit next to my ladybug chair. 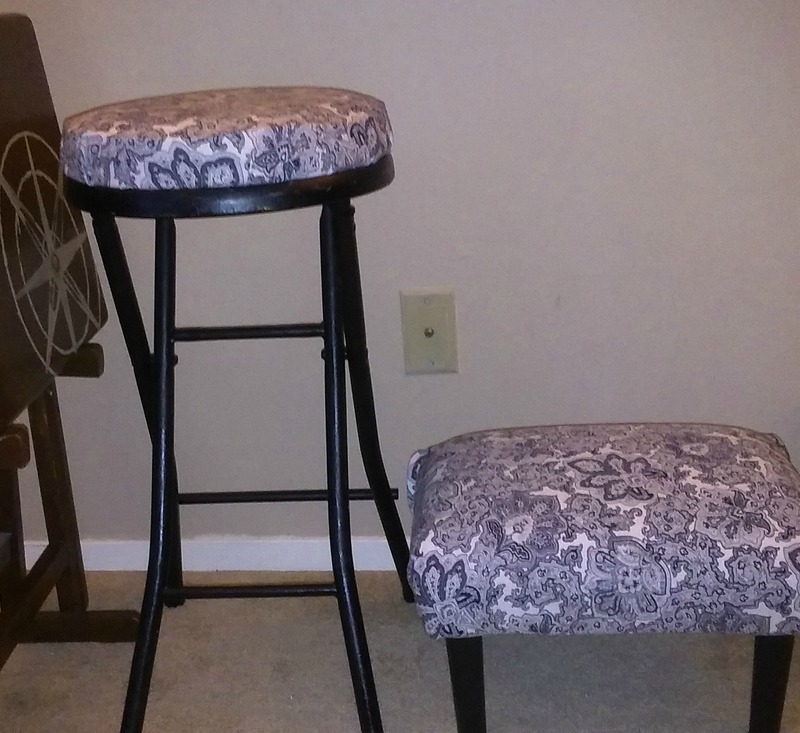 The chair was repainted black to match the stool. I thought they were cute. Neither sold. After closing my booth I kept the chair and remade the stool using the same remnant fabric for the shaggy dog stool. 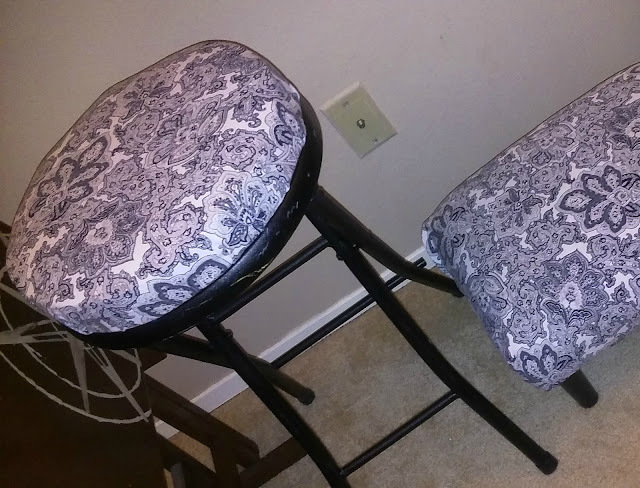 I think they look nice together...but I've been wrong on these matchy-matchy mismatched seats before. Here they are tucked into the corner of my craft fair booth. It was in a gym, hence the ugly flooring and poor lighting. mismatched stools for your home? 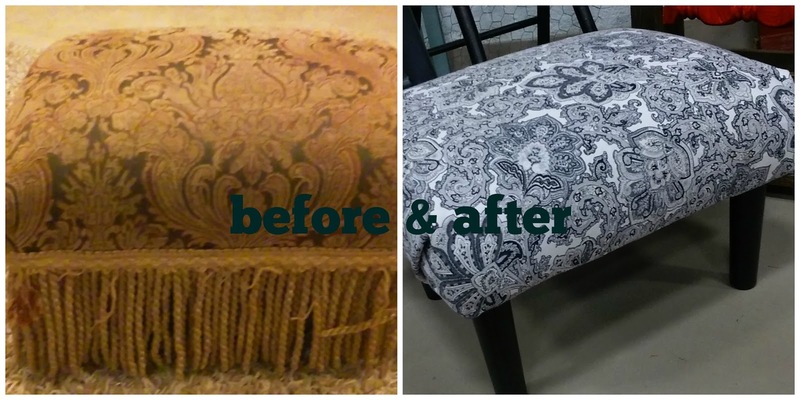 Yes...I think repetition of pattern on mismatched objects provides interest and flow in a room. Love the pattern.